On Saturday, 14 October, a truck loaded with explosives was detonated close to a hotel in Mogadishu, Somalia. The explosion resulted in over 700 casualties, with 358 confirmed deaths to date and many more injured. Individuals suspected of involvement were arrested and detained, and are currently under investigation. A large truck was used in the terrorist attack containing several hundreds kilograms of both military grade and homemade explosives. The truck was detonated near the Safari Hotel in KM4 Street, Hodan District in Mogadishu. According to reports, the actual target of the truck driver was the Somalia's Foreign Ministry where most embassies, the Amison headquarters (the peacekeeping force of the AU) and a UN building are located. A second bomber driving a minivan was arrested and detained. The minivan driver is a veteran militant involved in previous attacks in Mogadishu. 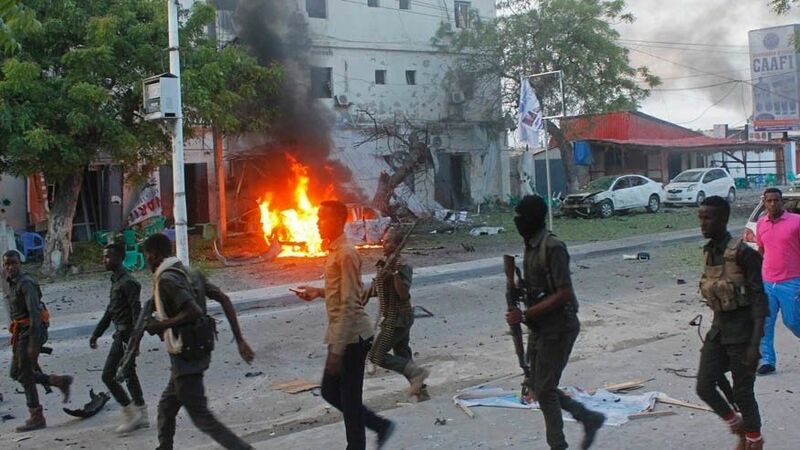 He then told Somalia's Security Force that he was proud of what he had done, that it was for jihad, and that the al-Qaida linked group al-Shabaab planned the attack. Al-Shabaab has still not claimed responsibility for the attack. Somalia Security Force said the minivan driver revealed that the attack was to be carried out by two vehicles, a large truck and a Toyota Noah minivan. Loaded with 350kg of military grade and homemade explosives, the Toyota Noah was to blast open the heavily guarded Medina Gate entrance making way for the larger bomb (the truck) to be detonated at the Foreign Ministry. Nevertheless, the minivan driver was stopped at a checkpoint, several hundred meters from the target, arrested and detained. The bomb was possibly set off by security, remote control or the driver himself, but detonated without casualties. The truck was first stopped at a checkpoint in Sinka Dheer, 7km outside of Mogadishu, with explosives concealed under agricultural goods and a tarpaulin. A local businessman and tribal leader vouched for the driver who was briefly detained. At the second checkpoint, security became suspicious of the truck and wanted to search the vehicle. The driver accelerated through the barrier detonating the explosives nearly a kilometer from the Medina Gate entrance, and igniting a nearby fuel tanker which caused a fireball. Buildings and people in the vicinity were incinerated. More than a 110 victims were buried by their families. Due to the extent of the explosion, the truck type could not be identified from the wreckage. 160 badly burnt bodies were buried by the government on the day after the attack. Officers on duty who dealt with the truck driver at the Sinka Dheer checkpoint were removed from their posts and are under investigation. The tribal leader that vouched for the truck driver has been jailed. All personnel who tried to stop the truck at the second checkpoint are deceased. President Mohammed Abdullahi Mohammed declared 3 days of mourning for the lives lost in the deadliest terrorist attack to hit the country. In the wake of the attacks, Somali people from around the world have been driven to action. The country has seen a large drive for blood donation, and an outpouring of support from Somali people abroad in the form of donations and spreading awareness about the conflicts within Somalia. The government will be investigating ways to ensure that future attacks can be averted.